From humble beginnings as Northern Racing, bet365 Sports has since evolved into a betting behemoth generating millions in monthly revenue and, importantly, just as many winners. Owned and operated by a private firm headed by the Coates family, bet365 Sports now serves more than 14 million customers in 200 countries across the world. These corporate credentials make those inside the bet365 boardroom winners in a general sense, but they also mean something for the sports betting community. By having the infrastructure and capital to sustain a workforce of more than 2,000 staff, it also means that the bet365 Sportsbook is able to offer more wagers, more bonuses and more deals for both new and existing punters. Place your qualifying bet up to £50 on any market for the match in question. Once the game kicks off place another bet of the same amount in play on any market. If your in play bet loses you will receive a refund of your amount up to £50 in cash. The Euro Soccer accumulator offer at Bet365 gives you the opportunity of winning 100% more on your accumulators when used on the top domestic leagues in Europe, along with the group stages and knockout stages of the Champions League. Offer applies to winning returns on pre match accumulators of at least 3 selections. Applies to full time result or result/both teams to score markets for the English Premier League, Serie A, La Liga, Bundesliga or UEFA Champions League. The maximum bonus receivable is £100,000 or currency equivalent. Bonus will not apply where a stake has been fully cashed out. If a stake has been partially cashed out, the bonus will apply to the remaining active stake. If your bet loses on a number of different markets, placed on a match that ends 0-0 Bet365 will refund your stake in full. This offer applies to pre-match bets on any correct score, half-time/full-time or scorecast markets for any football match. Offer does not apply where a stake has been fully cashed out. If a stake has been partially cashed out, the money back offer will apply to the remaining active stake. In terms of betting options, bet365 offers up a veritable smorgasbord of treats for punters of all persuasions. Regardless of whether you have a hankering for handball, a taste for tennis or love the lotto, bet365 has something to satisfy every palate. As you'd expect, the industry favourites, such as football, golf, horse racing and tennis, are all in place, as are a number of exotic options. Because bet365 Sports is able to employ a large team of statisticians, it means it can offer odds on virtually any activity in the world. Indeed, as well as traditional sports, the operator also runs markets for e-sports, poker, politics and TV. 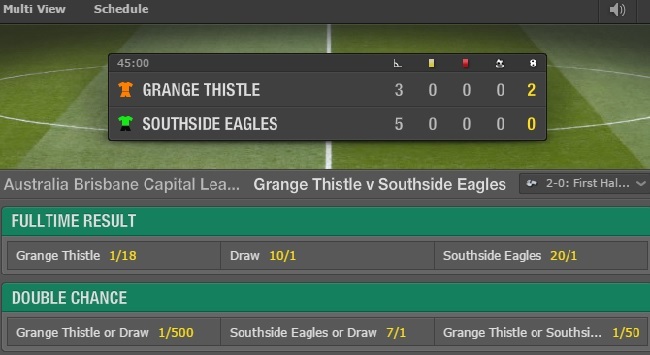 Essentially, if there's a potential winner or loser, bet365 gives you the ability to speculate on it. In order to stand out in the modern online sports betting market, a company needs to employ the latest gadgets. Simply hosting a collection of odds and options inside a desktop portal is simply not enough to pique the interest of the canny sports bettor in the present climate, which is why bet365 has embraced as much tech wizardry as possible. Headlining the software package is an advanced in-play betting system. Giving players the ability to speculate on a range of events currently in action, the system not only provides the latest odds, but stats from each encounter as well as a computerised representation of the action. Summarising recent events and offering some form of analysis not only gives you a better idea of the event's flow, but how the action may play out. From a betting standpoint, this is fantastic as it makes the process of picking a winner markedly easier. Betting options on more than 40 sports and in 15 languages. In-play betting and 60,000+ live streams every year. Place transactions using: Visa, MasterCard, Neteller, Skrill, Ukash, PayPal, Bank Transfer and more. Best odds guaranteed and thousands of pounds in bonuses every month. To start your bet365 betting adventure today, follow our dedicated download link. Three tips from around the tracks for you this Tuesday. There's action from three different leagues in this 15/1 four-fold!